Charger Alert v1.3 for the BlackBerry Q10 and Z10 has been released at BlackBerry World. Added temperature alert to inform you if the battery is overheating. The temperature is displayed in either Celsius (°C) or Fahrenheit (°F) depending on your region. You can manually change this in ‘Settings’. 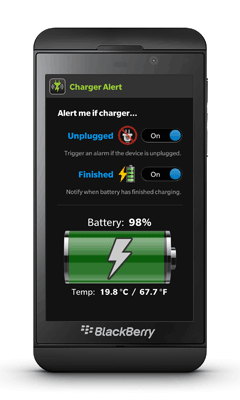 Charger Alert v1.2 for BlackBerry 10 has been released at BlackBerry World. Active frame now shows alerts and battery information when the app is minimized. Charger Alert v1.3 has been released to the Google Play store. The guard must now be manually disarmed before unplugging the device to stop the alarm from sounding. This makes Charger Alert more straightforward to use and allows it to work with custom screen lock apps. Fixed a bug with a disappearing guard notification icon in ICS. A list of changes (changelog) is now displayed whenever the app is updated. Note: It is recommended that you lock your screen to prevent someone else from disarming the guard. The first public release of Charger Alert for BlackBerry is now available on BlackBerry App World. If you have any feedback or encounter any problems using the application please report it here so that it can be looked into. We hope the Charger Alert app proves to be a useful tool for you, and if you like it, please spare a few moments to rate or review it. Charger Alert v1.2 has been released to the Google Play store. Alarm volume can now be set to a custom level. Improved handling of alarm volume. Fixed a bug where the upgrade option didn’t always appear when available. Added a number picker interface for the alarm delay setting. Note: If you had previously set the alarm delay option, please update it in the settings menu using the new interface. The first release of Charger Alert for Android is now available on Google Play (Android Market). Charger Alert v1.0 is just the beginning, with more features and improvements planned for future versions. We hope the app proves to be a useful tool for you, and if you like it, please spare a few moments to rate or review it.